Yew Poisoning is the accidental or intentional intake of plant or plant product. Yew Poisoning may be also referred to as Yew Toxicity. What are the Causes of Yew Poisoning? What are the Signs and Symptoms of Yew Poisoning? The signs and symptoms can vary from one individual to another. It may be mild in some and severe in others. Not all individuals who consume the plant parts/products may show symptoms. How is First Aid administered for Yew Poisoning? Who should administer First Aid for Yew Poisoning? First aid for Yew Poisoning is administered by healthcare professionals. What is the Prognosis of Yew Poisoning? 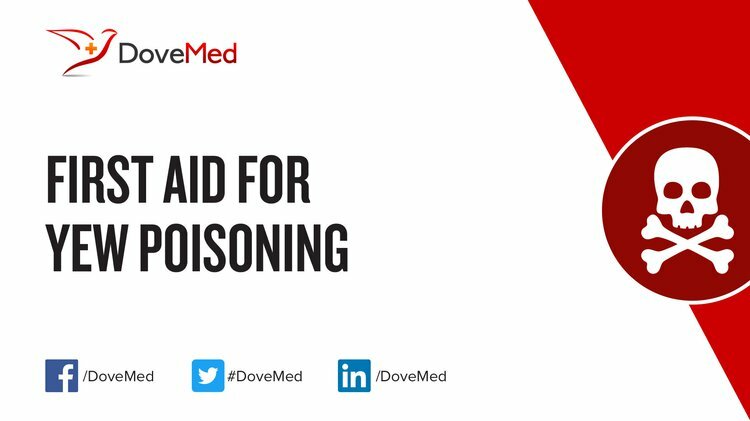 How can Yew Poisoning be Prevented? Gausterer, C., Stein, C., & Stimpfl, T. (2012). Application of direct PCR in a forensic case of yew poisoning. International journal of legal medicine, 126(2), 315-319. Panzeri, C., Bacis, G., Ferri, F., Rinaldi, G., Persico, A., Uberti, F., & Restani, P. (2010). Extracorporeal life support in a severe Taxus baccata poisoning. Clinical toxicology, 48(5), 463-465. Soumagne, N., Chauvet, S., Chatellier, D., Robert, R., Charrière, J. M., & Menu, P. (2011). Treatment of yew leaf intoxication with extracorporeal circulation. The American journal of emergency medicine, 29(3), 354-e5. Vališ, M., Kočí, J., Tuček, D., Lutonský, T., Kopová, J., Bartoń, P., ... & Klzo, L. (2014). Common yew intoxication: a case report. Journal of medical case reports, 8(1), 4. Froldi, R., Croci, P. F., Dell'Acqua, L., Farè, F., Tassoni, G., & Gambaro, V. (2010). Preliminary gas chromatography with mass spectrometry determination of 3, 5-dimethoxyphenol in biological specimens as evidence of taxus poisoning. Journal of analytical toxicology, 34(1), 53-56. Hough, R. L., Crews, C., White, D., Driffield, M., Campbell, C. D., & Maltin, C. (2010). Degradation of yew, ragwort and rhododendron toxins during composting. Science of the total environment, 408(19), 4128-4137. Burcham, G. N., Becker, K. J., Tahara, J. M., Wilson, C. R., & Hooser, S. B. (2013). Myocardial fibrosis associated with previous ingestion of yew (Taxus sp.) in a Holstein heifer: evidence for chronic yew toxicity in cattle. Journal of veterinary diagnostic investigation, 25(1), 147-152. Grobosch, T., Schwarze, B., Stoecklein, D., & Binscheck, T. (2012). Fatal poisoning with Taxus baccata. Quantification of Paclitaxel (taxol A), 10-Deacetyltaxol, Baccatin III, 10-Deacetylbaccatin III, Cephalomannine (taxol B), and 3, 5-Dimethoxyphenol in Body Fluids by Liquid Chromatography–Tandem Mass Spectrometry. Journal of analytical toxicology, 36(1), 36-43.